Square Enix continues the story of Kingdom Hearts on the 3DS with a tale of friendship, duality, and Jeff Bridges. With Chain of Memories, 358/2 Days, Birth by Sleep and Re:coded, the portable spinoffs of Kingdom Hearts now outnumber the main series games two-to-one. While Sora and his supporting cast have spent a lot of time fleshing out side-stories in-between main installments, Square Enix seems ready to advance the overall plot once more in Kingdom Hearts 3D: Dream Drop Distance. While Dream Drop Distance is definitely not Kingdom Hearts III, the game faithfully recreates the frantic combat, distinctive visuals, and occasionally bizarre movie tie-ins of its PS2 predecessors. By taking control of series protagonists Sora and Riku, players will travel through a number of new Disney worlds and encounter some surprising Square Enix characters along the way. The hands-on demo begins in the world of Tron: Legacy, which may feel familiar to series fans who already guided Sora through the world of Tron in Kingdom Hearts II. While a tutorial in an earlier level will bring new players up to speed on the basic principles of combat, series veterans will feel right at home. Sora, aided by two AI-controlled party members, swings his trusty Keyblade (for the uninitiated, this weapon is exactly what it sounds like) in fluid combos that differ depending on a player's position, timing, and proficiency. At first, it's easiest to just mash "attack" and slowly chip away at an enemy's HP, but as enemies emerge with shields, flight, and teleportation, players will learn how to get around enemy defenses, perform mid-air combos, and monitor the often-chaotic battlefield around them. While the fundamental mechanics remain unchanged, Sora's party looks a little different than before. While Disney mainstays Donald Duck and Goofy previously accompanied the teenage adventurer, Sora can now choose from a variety of benevolent critters known as Spirits. These Spirits are colorful, somewhat amorphous entities that fill traditional RPG party roles, such as healer, mage, or melee fighter. While some fans may be disappointed that no humans join Sora's party this time around, the monster collection element to party creation may help salve the wound. Players can recruit a wide variety of Spirits and level them up as they see fit. 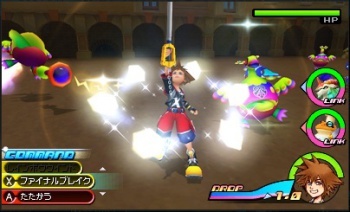 Furthermore, Sora has a unique special attack with each spirit, which means that collection and experimentation are key. Sora and his two companion Spirits make their way through the blue-white digital landscapes of Tron: Legacy with a combination of battles and platforming. As is the case with previous entries, Dream Drop Distance involves a fair amount of vertical level design, and Sora will be required to make some tough jumps during his quest. In order to aid players, Square Enix has implemented a "free-flow" platforming system, which allows Sora to manipulate the environment to his advantage. For example, in the demo level, Sora can race along red grids, launch himself off of walls, and propel himself upwards from a standstill. While the system helps considerably with platforming and combat, its implementation leaves something to be desired. The camera can be unwieldy when Sora turns and jumps rapidly, leaving players traveling in the wrong direction or directly into a wall. After getting the hang of the free-flow platforming and fighting a number of Nightmares - a motley, colorful collection of enemies that serve as cannon fodder and mirror the Heartless and Nobodies of earlier games - Sora and company arrive at the level's first major cutscene. While the demo was entirely in Japanese, the general concept was easy enough to grasp. Sora meets up with the main cast of Tron: Legacy, including a spectacularly rendered Jeff Bridges, as he introduces himself and becomes intertwined with the movie's plot. The character design and facial detail in this section were especially striking, as the digital avatars captured a good deal of nuance in both the appearance and mannerisms of the original film actors. Jeff Bridges appeared with particular fidelity, from his piercing blue eyes, to his bristly beard and impassive gaze. However, graphics aside, the cutscene proved problematic. The characters spend a very long time trading exposition while standing almost still, and the scene drags on for minutes without any player interaction whatsoever. By the time Sora and the Tron: Legacy cast have explained their respective dilemmas and the scene has shifted to show the stage's villain creating an imposing new Nightmare, a good five minutes have disappeared into the void without much plot progression to show for it. Post-cutscene, the game proceeds much as it had before, with a mix of harder enemies, more challenging platforming sections, and increasingly labyrinthine areas. Some of the more open areas showcase the game's near-PS2 quality visuals and well-implemented 3D. Foregrounds and backgrounds are easy to distinguish, and Sora appears in a crisp, pleasant middle distance. Square Enix definitely designed Dream Drop Distance with the 3DS in mind, and the attention to detail shows. Unfortunately, these open areas also highlight the game's problematic camera. Without a second analog stick, players are left to the whims of an occasionally competent automatic camera, and the L and R buttons. In what is by now a Kingdom Hearts tradition, the camera is problematic without player input, and imprecise with it. While the demo focused on Sora's story, this is only half of the Dream Drop Distance experience. As Sora adventures, his "drop" meter will gradually fill. When it reaches peak capacity, gameplay switches over to deuteragonist Riku, and the cycle begins anew. Each character has a unique story in each movie world, so while some locations will repeat, no two story segments will be alike. Square Enix promises that the in-game tutorial and journal entries will bring new players up to speed on the Kingdom Hearts story so far, but Dream Drop Distance seems like a game directed very much towards existing fans. If the promise of new worlds, a modified party system, and a novel character-switching mechanic sound appealing, Dream Drop Distance probably merits a look. If not, you can wait for Kingdom Hearts III; just be prepared to wait a long time.